WD TV Play is the latest device launched by Western Digital. Like the TV Live and TV Live Hub, the WD TV Play is the streaming device which will allow user to access various internet sites for streaming and will also allow users to access their media files like audio files, photos and videos. 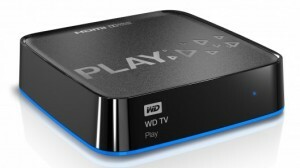 The WD TV Play has connections including Ethernet, HDMI and Composite A/V in addition to the USB 2.0 port. All the connections are at the back side of the device. It also has a built-in Wi-Fi capability and supports Optical audio. Along with streaming clips from internet, the device will support streaming of personal audio/video media clips via USB port. The streaming device has modified tablet like user interface for navigation. Further improvement is in the remote control where dedicated buttons are provided for Netflix, Vudu and Hulu . The WD TV Play streaming device brought by Western Digital will be affordable too. The earlier products like TV Live and TV Live Hub were priced at $99; however the WD TV Play will cost around $69, saving of $30. Let’s see how the features rich WD TV Play streaming device gets a response from users.